USDOT announces local hire initiative! This is good news for Metro, which had lobbied for a change in the law. The issue: up-to-now, Metro was prohibited from hiring workers based on where they lived on projects that use federal dollars — even if the workers lived next door to a transit project. The U.S. Department of Transportation is described in the fact sheet posted above. Earlier today, the Obama Administration announced that they will be launching a one year pilot program to permit local hiring for projects funded through FHWA and FTA. On September 15, 2011 Metro’s Board of Directors added the goal of reforming federal local hire rules to our successful America Fast Forward initiative. We are grateful to our Board of Directors for making the local hire issue a priority in our federal legislative program, and to Congresswoman Karen Bass (D-37) – who successfully included language reforming federal local hire rules in the omnibus spending bill (H.R. 83) adopted during the very last days of the 113th Congress. The language, in part, allows for local hiring for transportation projects using Federal Fiscal Year 2015 funds. We are also grateful to the Obama Administration and U.S. Transportation Secretary Anthony Foxx for his strong leadership on this matter. 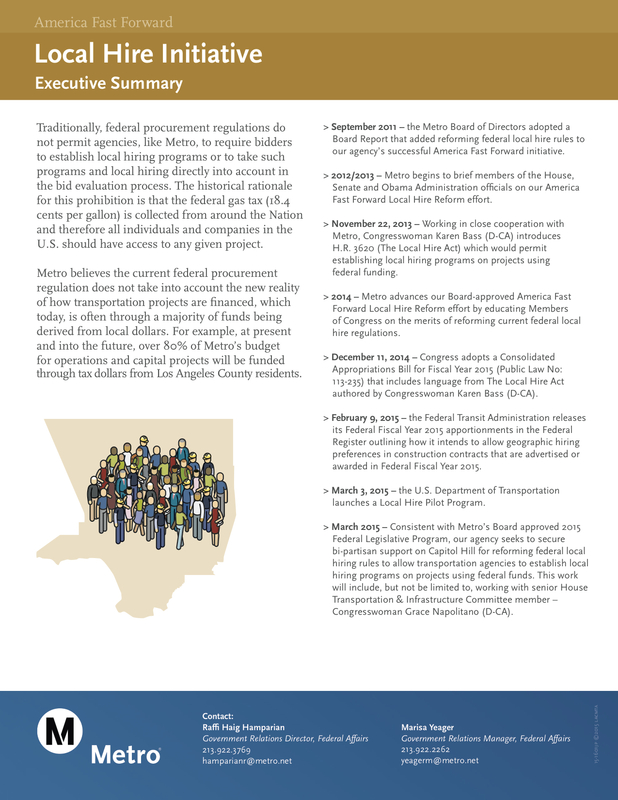 Please find below a Metro Fact Sheet (PDF) on our efforts to reform federal local hire rules and the original Board Report from September 15, 2011 wherein Metro’s Board added this issue to our America Fast Forward program.